As parents, every day-- every minute-- we make decisions. We decide to react this way or that way, and it has to happen immediately. Split second decisions are commonplace. Our first level of decision-making is to keep our children safe. It's in our biological make-up-- to protect our brood. The rest fall into murkier territory. These are the decisions that can be made differently by a million different people. These are the choices that aren't life or death, but on some level reflect our goals and values. I've been thinking about a non-life-or-death, murky decision I recently made. A couple of weeks ago, I took my kids to a rare lunch outing at a McDonald's with a Play Place [bring on the Advil and hand sanitizer!]. My daughter (almost 4) had been begging to go, and sometimes I throw my hands up, surrender, and try to have some fun with the kids (that's part of the point, right?). My two littles scarfed their Happy Meals, and then I watched them like a hawk as they winded their way around the primary-colored tunnels. Or, I watched as much as I could, as the tubes they crawl through are opaque. I heard mixtures of shouts, laughs, cries, and whatever other noises children make. Par for the course. I was cleaning up our table, feeling pretty happy, when a little girl came over and communicated that my son (age 6) had hurt her on the nose and it still hurt. Well, of course, that's not good. I don't want my son to be physically aggressive. I hate violence. I quickly apologized for his behavior and assured her I would talk to him about it. 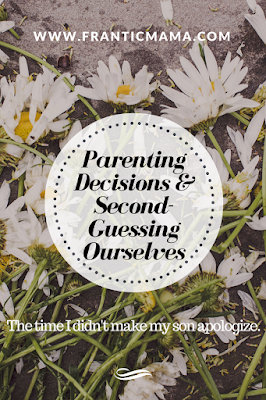 I had a split-second decision to make, and that's what I decided based on my son's personality, his intensity level (high), and my values (we don't hit people). I would talk with him. I would also get his take on what happened, as I hadn't seen it. Most of all, I would use it as an opportunity to help him improve his social skills. I realize not every one would take this tactic. Some might immediately find their child and march them up to the girl to apologize. That might be the right choice for them, but I knew that wouldn't work for us. I knew deep down my son would throw a huge fit and learn nothing from the incident. If I tried to force him, the girl would not get the sincere apology she was hoping for. I looked around to see if the girl was being supervised. Her mother or caregiver was looking right at the girl and me, smiling with what appeared to be support and approval of the little girl, and perhaps a wee bit suspicious of me. Truthfully, it felt uncomfortable on a lot of levels. When my son came down from the Play Place, I asked him if he had hit someone; he admitted he had. He also said she was pointing at him over and over and saying "hey you!" I could tell he was frustrated by the whole situation. Oh geez. Hitting is never okay, but pointing and yelling at my son is definitely not the way to talk to him. Nothing good will come of it. I quickly told him that hitting is never okay, and that even if someone is bothering him, he needs to walk away rather than retaliate. He felt bad. He looked remorseful. I knew I would address it again with him in private later as a follow-up. I also had a higher purpose in my head: I had gone to lunch with my kids to let them have some fun together and to enjoy them before school started up again, after a rather challenging summer. I didn't want to end it on an awful note. I was now ready to go, salvaging what was left of our decent mood. We walked out of the Play Place and, whew!, I've never felt eyes burn into my back as much as they did that day. I could feel the woman's (and girl's) eyes on me, and I'm pretty certain it was in shock and disdain that I didn't march my son right over and force him to apologize. Or maybe I was imagining it. Was I wrong? Maybe. Something in me also says perhaps my quick decision was okay, even if it wasn't perfect. Would the apology have been sincere? Would he have even done it? I can't make him do something, though I suppose I could threaten or bribe him to do it-- but doesn't that take away the purpose of an apology? 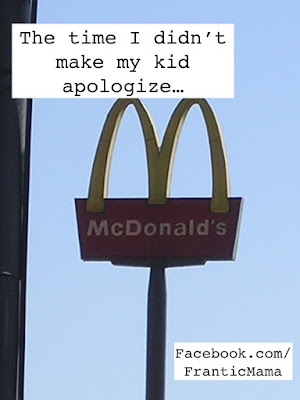 Is that the spirit of being sorry I want my son to learn? I have run through the scenario several times in my head (per usual), and I'm not convinced I did the right thing. I'm not convinced I did the total wrong thing either. How about you? What murky decisions do you question after the fact? How do we know if we are making the "right" choices, and how do we define "right?" Find me on Facebook, Instagram, and Twitter. Thank you. Yes, I think it would have been more socially acceptable to get him to say he was sorry, but at the same time, as you say, sometimes ignoring those norms isn't the worst thing. It was a tricky call. Grace is needed :). This is beautifully written. My son too is deep and complex and his expressions of those feelings are deeper and more complex too. We have had similar incidents, not once but many times especially in the playground. I feel like this everytime this happens , it is not always true that the one who comes up to complain and seeks apology was completely innocent. I always make sure to listen to my son's side of the story too. He understands that hitting someone is not the right way to handle and he doesn't. Yet, he gets annoyed when someone teases him and roars at them.we are working hard on it and he is trying to understand. He is a very soft spoken child otherwise. And you are absolutely right that a forced apology isn't a sincere apology at all. Glad to hear you've faced similar situations...or wait, not "glad" that it happened, but glad I'm not the only one dealing with these things. I watch in awe and wonder when I see kids effortlessly navigate the trenches of the social world. It's a little heartbreaking when your child has a hard time with it.